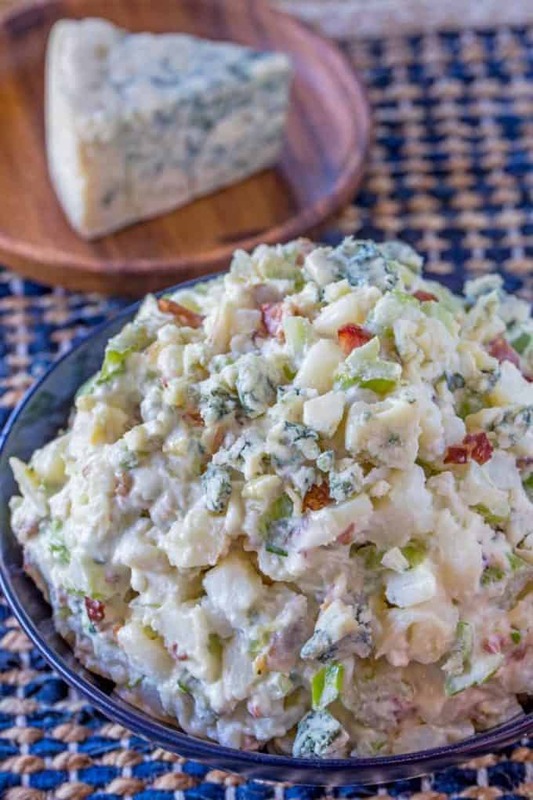 Bacon Blue Cheese Potato Salad takes the classic potato salad and kicks it up a notch with the flavors of bacon and blue cheese. This will be a summer bbq favorite! 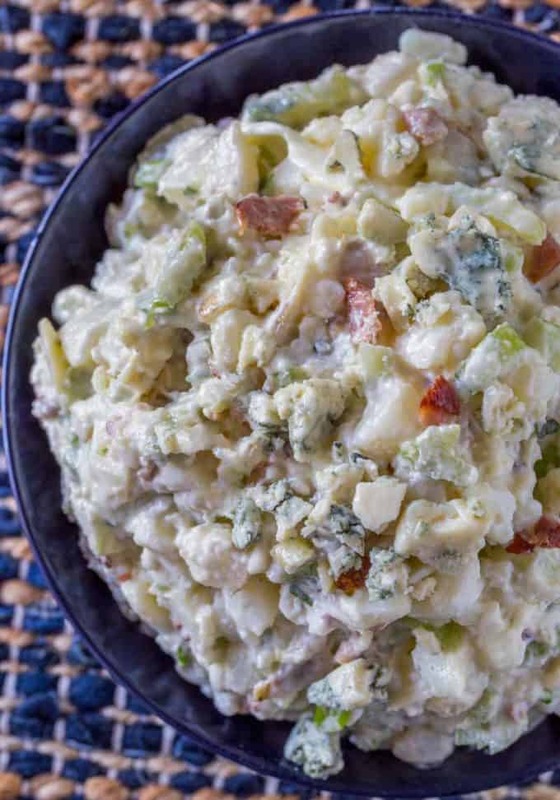 Bacon Blue Cheese Potato Salad has become one of our favorite potato salad recipes because with the addition of two such strong flavors you don’t feel like you’re eating pure carbs for the sake of it. We like to make different flavored sides and salads because when people come over they always expect something different from the normal backyard party. 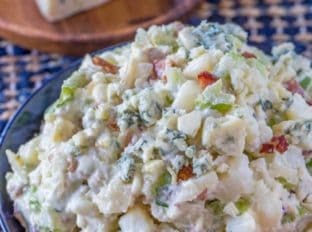 This Bacon Blue Cheese Potato Salad came about because we were making bacon and blue Cheese burger covered in Jack Daniel’s sauce (this is so good!). With some extra bacon and blue cheese left over we mixed it into the salad. Okay if I am telling the truth I also added crispy thin onion rings. That may just be gilding the lily though for this recipe. Large Pot with Steamer Insert: Makes life so much easier to lift the potatoes out at once and let them cool without risking a burn trying to strain them into a colander. Kosher Salt: In 99% of the recipes on this site, you’ll find Kosher salt used. It’s super inexpensive but the flavor is miles better than table salt and less overwhelmingly salty. Duke’s Mayo: Best mayonnaise ever, and really does add so much to the potato salad. It is more readily available in the middle and east coast of the country, but hey Amazon Prime folks! Fill a large pot 2/3 of the way with room temperature/cold water and add in the potato chunks. Add 1/2 teaspoon Kosher salt. Turn the heat to high and cook the potatoes for 12-15 minutes or until fork tender. Drain the potatoes and rinse with cold water. 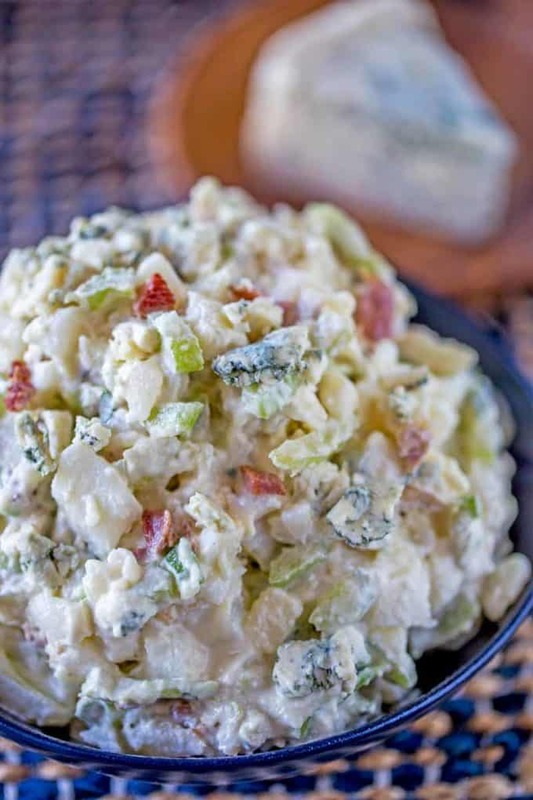 In a large bowl add the remaining 1/2 teaspoon Kosher salt, 1/2 teaspoon black pepper, blue cheese dressing, mayonnaise, celery, most of the bacon, most of the blue cheese and green onion. Stir to combine then add the potatoes and gently toss to combine. Garnish with blue cheese and bacon and serve. You had me at bacon and blue cheese! Love this combination in a potato salad. Right?! Those two are always winners for me too! OMG!! I LOVE blue cheese!! 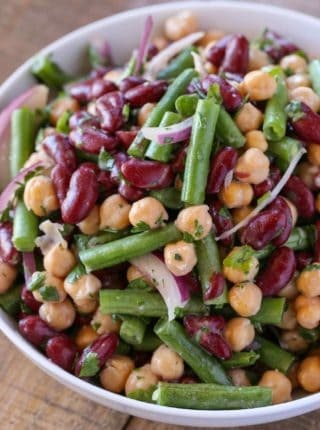 This is totally my kind of salad!! Looks fantastic! Ooo! I’m a blue cheese f-a-n! 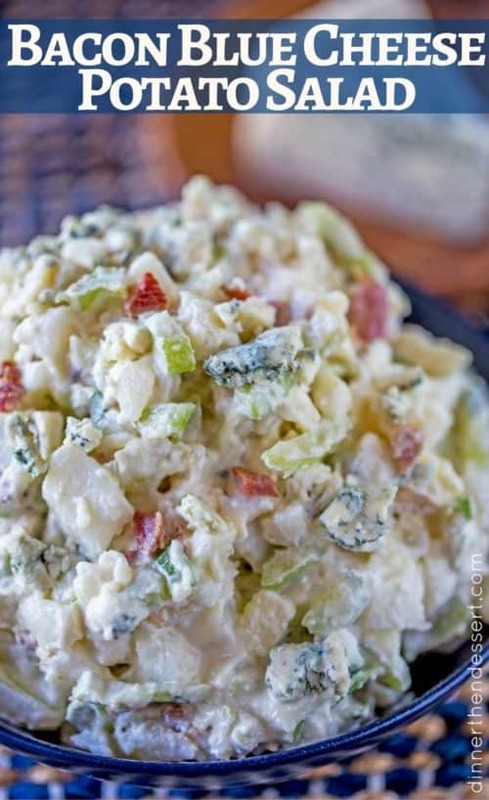 I can’t wait to try this potato salad – perfect with BBQ! You’re going to love this!! 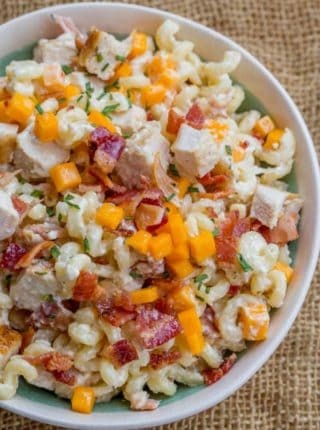 What a great twist on potato salad! 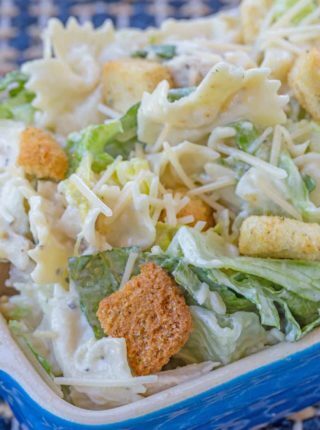 I love the blue cheese in there! You can’t go wrong with bacon and blue cheese! 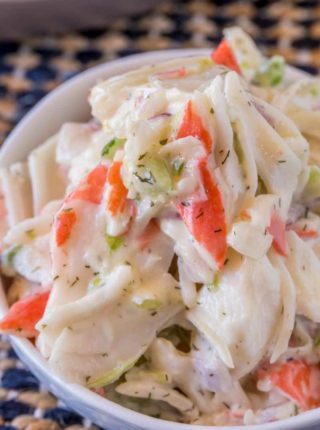 This potato salad looks perfect for summer. A perfect fit for summer!